Why do McDonald’s products look different from their advertisements? In an interesting marketing campaign, a McDonald’s representative answers a fan favorite question: Why do their advertisements make McDonald’s food look better than it actually is? Director of Marketing Hope Bagozzi of McDonald’s Canada takes you behind the scenes of an ad photoshoot to show the reasons and differences. Bagozzi starts by visiting a local McD’s chain to order a Quarter Pounder to illustrate what customers are used to seeing: a hamburger that’s generally flatter and pressed together than what you’d find in an ad. She then heads over to the photoshoot studio where a “food stylist” preps today’s model. The crew explains that a typical burger made in the fast food joint is made, well, fast, while the model takes much longer to perfect. However, all the ingredients, such as the bun, patty, mustard, ketchup, pickles, and onions remain the same. 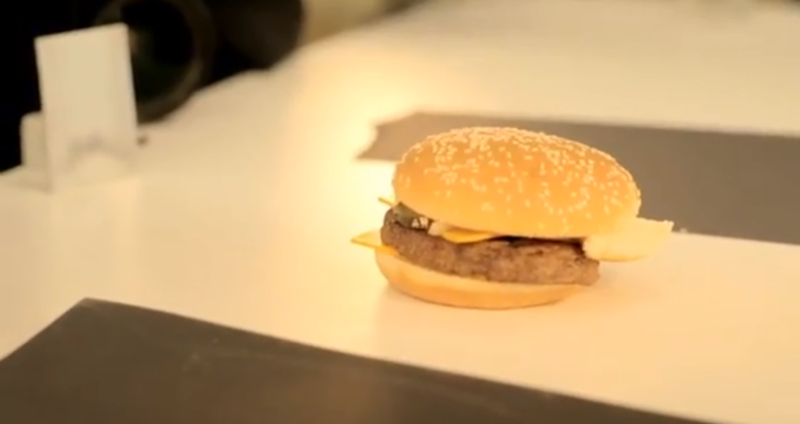 During the shoot, the burger is also not pre-stacked. Instead, the crew stacks each piece one by one, slightly reclining each layer back as they head toward the top. On a side angle, you can see how the top bun is mostly pushed back (and even held up by another piece of bread). According to McDonald’s, this is to show every ingredient a customer should expect to get when they buy the product. In reality, everything is stacked on top of each other so you can’t necessarily tell there are onions and pickles in between. After the photoshoot, the selected picture is then retouched to look even more enticing by saturating the colors and removing cracks in the burger buns. 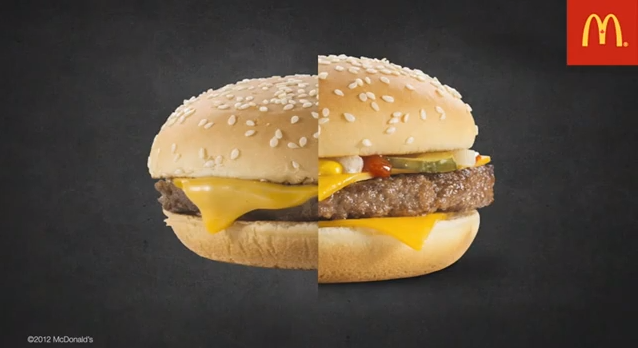 We’re thankful at least the ads use the same ingredients instead of replacing them with shoe polish and hairspray to bring life to a sloppy piece of burger. Or do they? Watch the video of Bagozzi answering the infamous fan question below and tell us what you think.